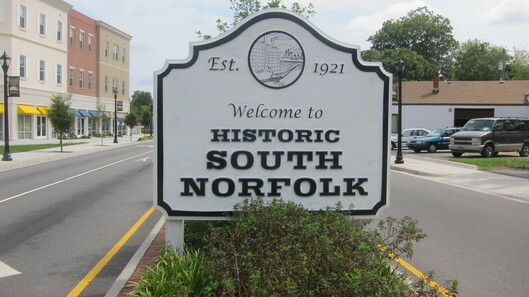 Located a few miles south of the larger city of Norfolk along the Southern Branch Elizabeth River, South Norfolk became an incorporated town in Norfolk County in 1919. Within three years, it became an independent city. In the early 1920s, streetcars ran from Ocean View in Norfolk, to South Norfolk. There was a ferry that docked at the end of Indian River Road and crossed the Southern Branch Elizabeth River to Portsmouth. 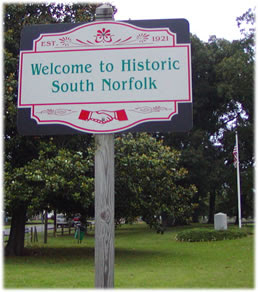 The much larger independent city of Norfolk expanded rapidly into the adjacent communities after World War II. 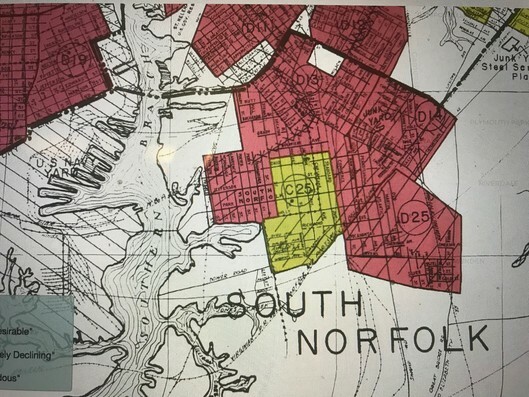 In 1963, after a referendum in South Norfolk and Norfolk County and with approval from the Virginia General Assembly, South Norfolk and Norfolk County merged to form the independent city of Chesapeake in 1963. The new name was also selected through a voter referendum. It's South Norfolk folks, not "SoNo." The new catch-phrase for South Norfolk, etymologically, "sono" from the Latin "somnus" or "sonus," meaning "sleep; state of sleep;" or as a Latin verb, "sono," meaning, "make a noise;" take your pick, (both ring hollow) has been used of late as a marketing ploy, to prey on the masses as a come-on, to shop or live in South Norfolk. "SONO"...are we talking about the Japanese Resturant? Maybe the financial stock, "Sono." Or "Sono" the rock band in Hamburg, Germany. 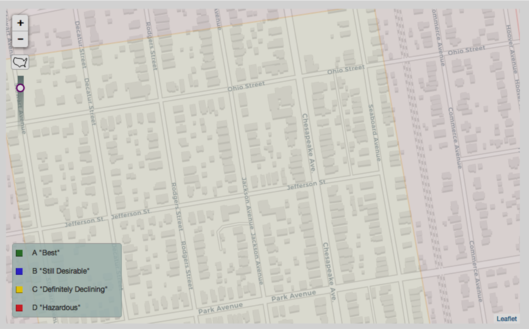 A historic district or heritage district is a section of a city, which contains older buildings considered valuable for historical or architectural reasons. "SoNo" does nothing to enhance that definition. Only a bourgeois, down-market, de clase baja individual could have come up with that moniker to denote what is suppose to be a 'historic' district. 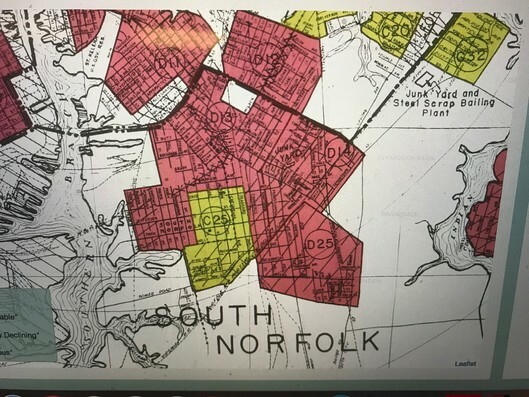 FDRs "New Deal" sponsored a system of "Redlining" which included the South Norfolk area. 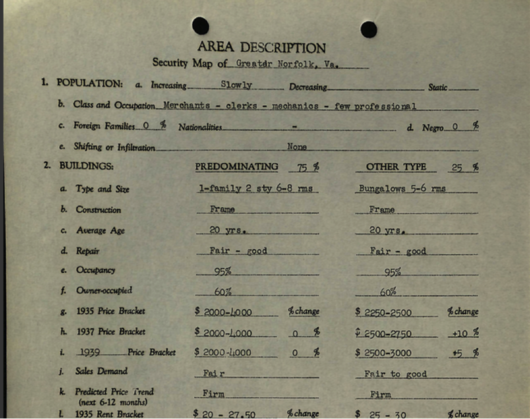 In the 1960s, sociologist John McKnight coined the term "redlining" to describe the discriminatory practice of fencing off areas where banks would avoid investments based on community demographics. 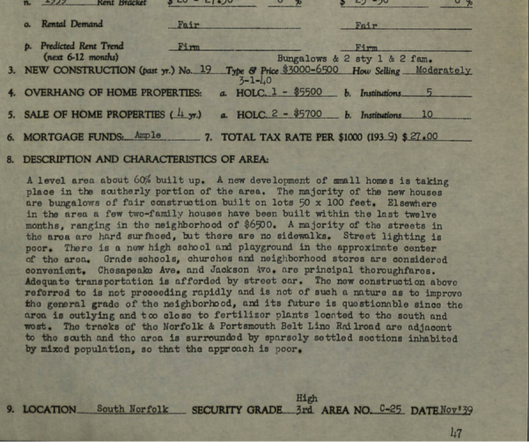 During the heyday of redlining, the areas most frequently discriminated against were black inner city neighborhoods. 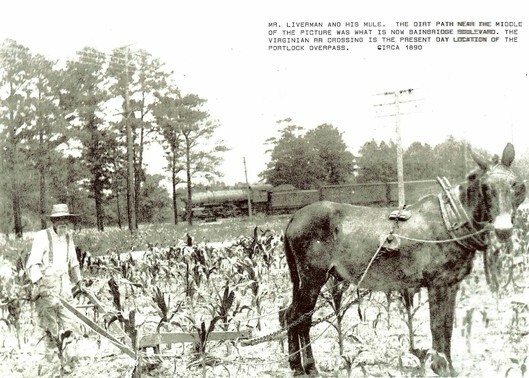 In South Norfolk, there was a systematic attempt in the 1930s, to prevent quality growth in South Norfolk. Middle Class residents and small business interests were discouraged from buying and investing in those areas that were "redlinned." Description and Characteristics of Area A level area about 60% built up. A new development of small homes is taking place in the southerly portion of the area. The majority of the new houses are bungalows of fair construction built on lots 50 x 100 feet. Elsewhere in the area a few two-family houses have been built within the last twelve months, ranging in the neighborhood of $6,500. A majority of the streets in the area are hard surfaced, but there are no sidewalks. Street lighting is poor. There is new high school and playground in the approximate center of the area. Grade schools, churches and neighborhood stores are considered convenient. 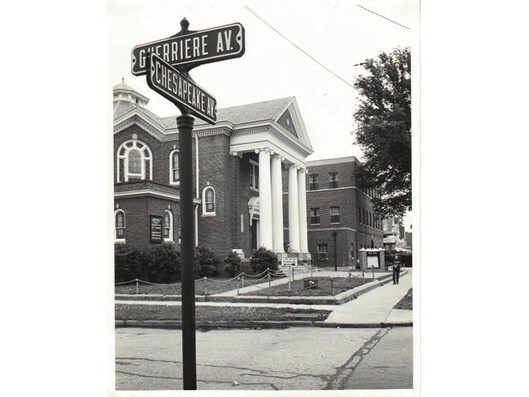 Chesapeake Ave. and Jackson Ave. are principal thoroughfares. Adequate transportation is afforded by streetcar. The new construction about referred to is not proceeding rapidly and is not of such a nature as to improve the general grade of the neighborhood, and its future is questionable since the area is outlying and too close to fertilizer plants located to the south and west. 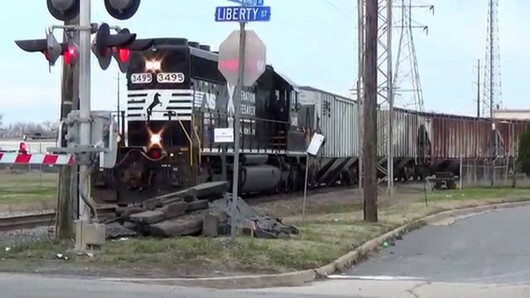 The tracks of the Norfolk & Portsmouth Belt Line Railroad are adjacent to the south and the area is surrounded by sparsely settled sections inhabited by mixed population, so that approach is poor. 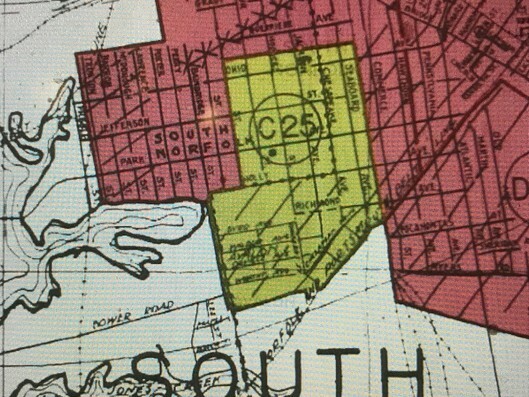 The map below, developed in the 1930s, shows the center of what is now called "Historic South Norfolk" in 'Yellow' which indicates "Definitely Declining." The North and East side is denoted in 'Red' which indicates "Hazardous." 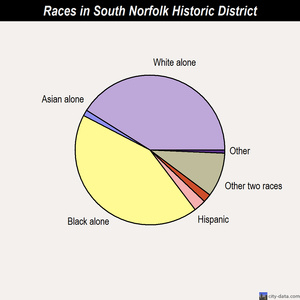 This was a blatant attempt to keep South Norfolk from developing into a prospering city. "D" and "C" areas were created to attract minorities and lower middle class whites. As of 1930, there were already clear differences along some of the borders in racial demographics and homeownership rates. Blacks and Lower Middle Class Whites were already more likely to be living in “D” neighborhoods than “C” neighborhoods, for example. But differences in the black share of the population and homeownership rates widened after the 1930s, reaching a peak in the 1970s, when federal laws requiring equal access to housing and credit took effect. People living in poorly rated neighborhoods would have had trouble obtaining mortgages for homes there, regardless of their individual creditworthiness. Other consequences most likely piled up from there. Lower Middle Class families who did not have access to conventional home loans had to turn to schemes like contract sales that entailed steep interest rates (the practice returning today in many of these same communities). Because those homes could be frequently repossessed by predatory lenders, these neighborhoods would experience more population instability. Slumlords, too, would move in, squeezing value from subdivided rental homes that otherwise might have been owned by families. Commercial investors, meanwhile, would have stayed away. Individuals discriminated against in the housing market elsewhere would have had limited options to move away. And any existing homeowners would have struggled to obtain credit for maintenance and repairs, leading to the further deterioration of properties. This process can be invisible to people who might look at these communities, Mr. Sugrue said, and place blame for their disrepair on residents who don’t value their homes. 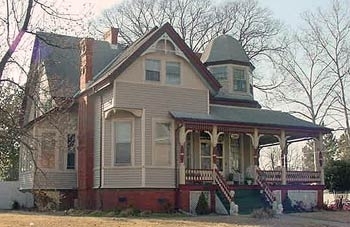 Several prominent professional men in the late 1990s thru the 2000s, attempted to renovate and restore many of the run-down homes in the historic section of South Norfolk. One whom I knew in particular, nearly went bankrupt in taking on this venture.